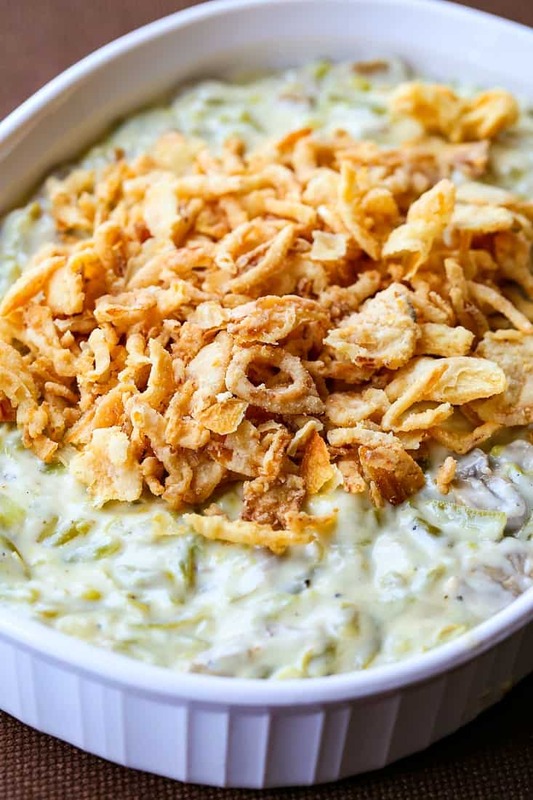 This Cheesy Green Bean Casserole is a classic side dish recipe with a cheesy twist! 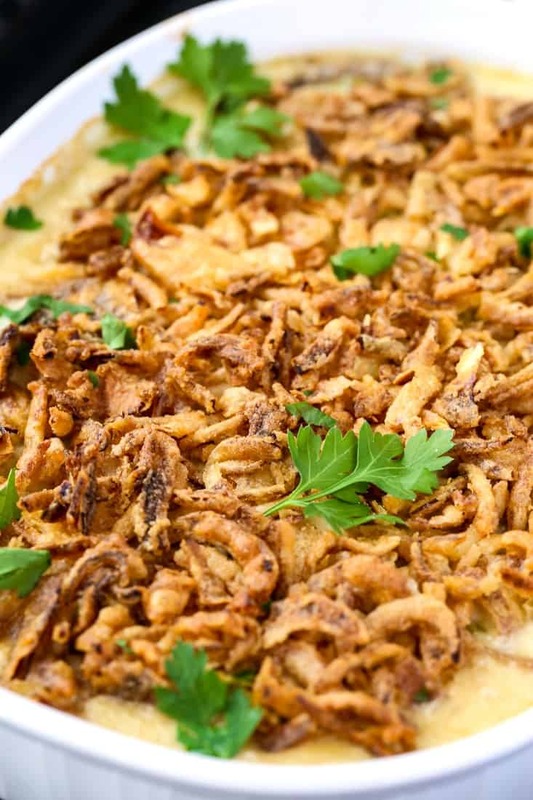 This green bean casserole with cheese is going to be you new favorite recipe! Today is day 5 of Side Dish Week and we’re bringing you this Cheesy Green Bean Casserole that we know you’re going to LOVE! And lots more side dish recipes just head over to our side dish menu! Everyone has a green bean casserole recipe for Thanksgiving, way back to the 50’s when it was invented. Let’s talk about this for a minute. Like a BIG minute. Can you imagine (being a food blogger) living in the 1950’s when you actually invented a recipe??? I mean it’s too bad there wasn’t an internet or social media to make those people famous because all they got was a small newspaper clipping or a hand written recipe that went into someone’s cookbook. Because literally everything has been invented by now. Sometimes we come up with an amazing recipe idea, then we google it and sigh. Because everyone has made everything. But maybe not with our little spin on the recipe to make it that much better. 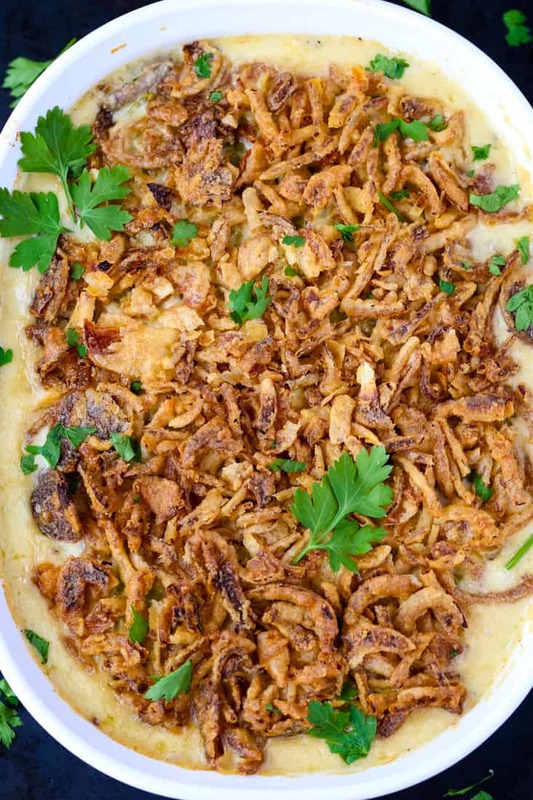 And that’s what we’re doing here with this Cheesy Green Bean Casserole recipe, a classic green bean casserole recipe with a cheesy twist. Just like bacon, it makes everything better. Canned Versus Fresh Green Beans? The classic green bean casserole recipe was made with canned green beans but fresh green beans work just as well in this recipe. If you’re using fresh green beans you can steam them for 5 minutes in the microwave or blanche them in a pot of water to soften them first. I think it’s a matter pf preference, or a matter of taste. We’re using canned today literally because it’s what we had, I’ve made this green bean casserole both ways and it’s delicious both ways. Yes, the classic Campbell’s Cream of Mushroom Soup, it’s actually what this recipe was created around back in the 50’s. If you have it, use it. 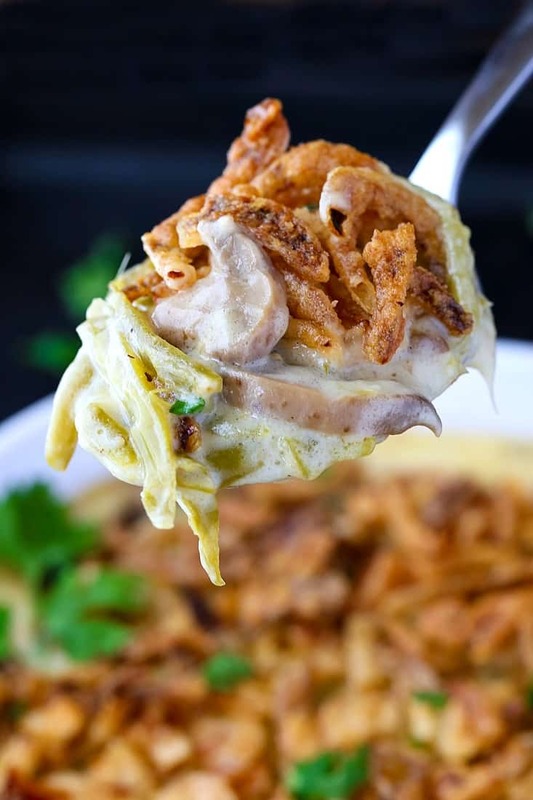 If you don’t have it or want to make this side dish recipe out of this world amazing, use my recipe here that makes a cheesy, creamy mushroom sauce more than a thick, condensed soup. 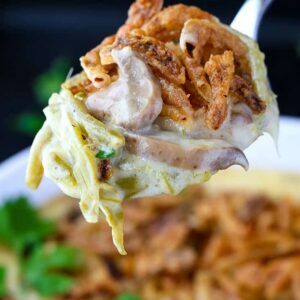 So for this Cheesy Green Bean Casserole recipe you’re going to start by making the mushroom sauce. In a large skillet add butter, onions, garlic, then fresh sliced mushrooms. Slowly whisk in chicken broth and heavy cream then bring to a simmer and reduce the heat. Lets this cream sauce simmer for 5 minutes until it gets nice and thick. Now add in the gruyere cheese, this cheese is so delicious you guys. We use it all the time, it’s like a milder, nuttier version of Swiss cheese and it’s one of my favorites for cooking. You can definitely substitute white sharp white cheddar, that will work too! Now you’ve got this nice, creamy, cheesy thick mushrooms sauce that’s going to be the base for your casserole recipe. Here’s where you add the beans…your fresh or canned beans…just pour them into the sauce. And that’s it. Green bean casserole is pretty much finished. At this point you can get it into your baking dish, cover and refrigerate until you need to cook it. 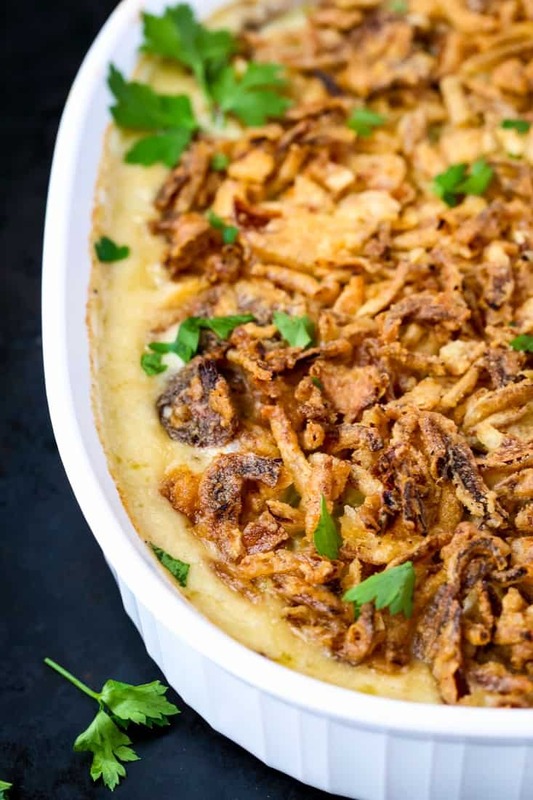 When you’re ready, add the crispy onions on top and bake. I’m telling you, you’ve got this. As far as side dish recipes, you want the ones that can be made ahead of time for big holidays like Thanksgiving. By the time Thanksgiving dinner comes all you need to worry about is carving the turkey and making sure everyone gets to the dinner table. If you’re really short on oven space you can also make this Cheesy Green Bean Casserole in a slow cooker! All you have to do is double the recipe here and cook it on low for 4 hours. After 4 hours you can turn it down to the “warm” setting if you’re not quite ready, then when it’s time to serve add the fried onions to the top, stick a serving spoon in and voila. OK so I hope I’ve given you guys ALL the options here so that you can add this green bean recipe to your holiday side dish menu with ease! This easy green bean casserole recipe can be made ahead of time so all you need to do is bake it in the oven when you’re ready! Once the butter is melted, add the onion and cook for 3-4 minutes to soften. Add the garlic, cook a minute more then whisk in the flour and cook for 1 minute. Pour in the chicken broth and whisk until the flour is incorporated into the broth. Add the heavy cream, whisk and bring to a simmer. Season the sauce with salt, pepper and nutmeg and continue to simmer for 3-4 minutes until the sauce has thickened. Add the cheese, whisking in the cream sauce until smooth. 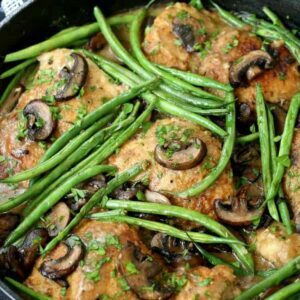 Add the green beans and mushrooms and stir to combine. 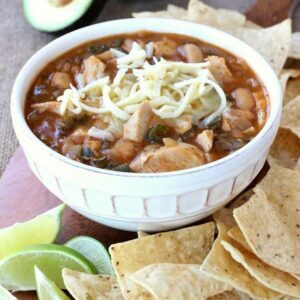 Pour the mixture into an 8″ x 8″ baking dish or a 2 quart casserole dish or gratin. 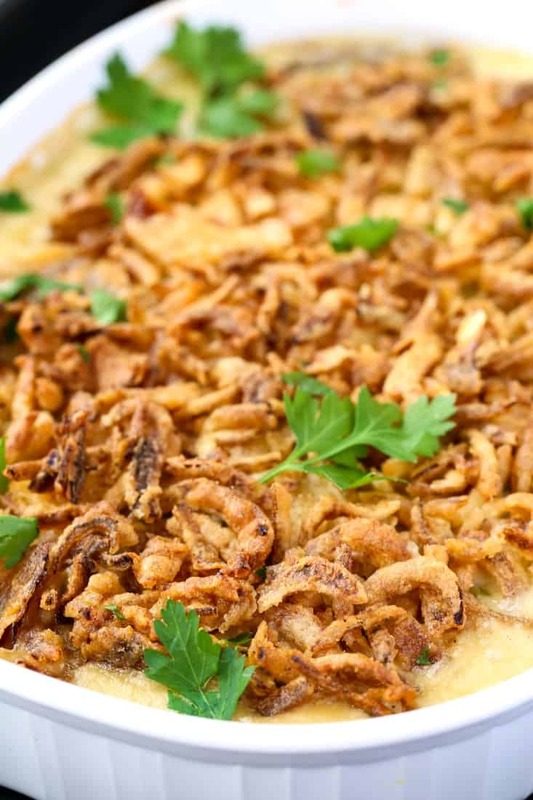 Add the fried onion to the top of the casserole and bake for 25 minutes until bubbling. 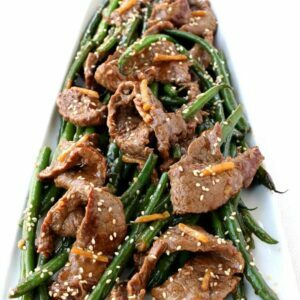 * If substituting fresh green beans you’ll need about 2 pounds of beans, trimmed and steamed or blanched. To steam the beans add them to a glass bowl with 2 tablespoons of water, cover with plastic wrap and cook in the microwave for 5 minutes. To blanche the beans, add them to salted boiling water for 5 minutes and drain. * To substitute fresh mushrooms, you’ll need an 8 ounce package of mushrooms, cleaned and sliced. Add the mushrooms to the skillet after the onions have cooked and before the garlic goes in. Cook the mushrooms for 5 minutes until browned, then continue with the instructions.